There’s an innate desire in humans to be the first to conquer an extravagant task. It’s a warrior’s mentality that requires solitude and focus in order to look down the mouth of the impossible. Damien Chazelle’s highly-anticipated Neil Armstrong biopic starring Ryan Gosling, FIRST MAN, chronicles the astronaut being crippled by grief and his nine-year trek to get to the moon. Jimmy Chin and Elizabeth Chai Vasarhelyi’s documentary FREE SOLO shows mountaineer Alex Honnald’s two-year journey towards scaling the 3,200-foot peak of El Capitan without a rope or harness. Neither of these feats had been accomplished prior to Armstrong and Honnold’s attempts. On paper, these films appear to be distant cousins, yet there is more connective tissue between the two explorers than one would think. There is a personal responsibility at play with these two protagonists, not to see happiness in their work, but to perform and perform perfectly at all times. Meaning: if you fail, you die. Ryan Gosling is Neil Armstrong in ‘FIRST MAN.’ Courtesy of Universal Pictures. Chazelle and Chin/Vasarhelyi’s films have tested the lengths a human will go to become great – the sacrifices, the rewards, and how the sacrifices make the rewards so much sweeter. There’s a beauty in that, but with that also comes self-loathing, a go for broke attitude that can allow dark emotions to rear their ugly head. 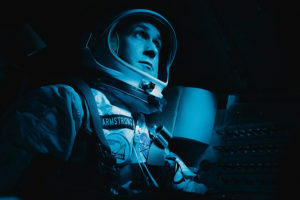 Throughout FIRST MAN, Gosling’s performance is completely internal, living in constant fear for the better part of a decade as he falls further away from his wife and sons in service of achieving a feat that could better humanity. 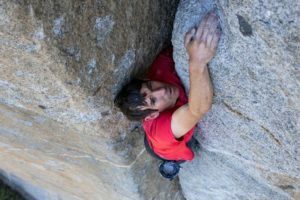 Honnold’s outlook in FREE SOLO boils down to achieving a personal benchmark, but, essentially, he just wants to set the bar higher for somebody else to do something “cooler” than he was able to achieve. (His words, not mine.) There’s a bit of levity that these two bring to their crafts, even if the possibility of martyrdom lurks in the shadows. In each film, we are put into the headspace of what it means to be the wife, or child, or even friend of a man with such dangerous convictions. At one point, professional climber Tommy Caldwell describes the experience of being a close friend to Honnold like “smoking cigarettes”: it’s addicting and dangerous. And, as heartbreaking as it is for Armstrong to neglect his wife and children, there’s a nobility that comes with the territory, a self-sacrifice that leads to something greater, not just for his family, but for the evolution of the human race. It may be the strangest act of service in human history. Each film suggests that it takes a certain level of emotional despondency in an individual to achieve something great. However, each of these filmmakers explore this terrain in fascinating ways that allow its audience members to find meaning in life, along with these two guys who feel “a bit” extraterrestrial. 33-year-old mountaineer Alex Honnold climbs the El Capitan, a vertical rock formation located in Yosemite National Park. Courtesy of National Geographic. Along with an intricate psychological portrait being framed, there’s a zen-like mentality that’s being tested by external forces. For Armstrong, it was the government red tape surrounding every mission; and for Honnold, it was something as simple as getting distracted by a film crew. In an early scene in FIRST MAN, Armstrong is having his psychology questioned by a room full of suits trying to figure out why this man would so willingly volunteer himself for an apparent suicide mission. The act of diving deep into the mind of these guys could uncover something less savory about their personalities, but it all boils down to personal responsibility. Honnold compares putting on his soloing shoes to a samurai picking up a finely tuned blade and preparing for battle. There’s a palpable feeling that comes along with that for any human being, whether it’s picking up your kids from school, picking up a paintbrush, or saving a cat from falling from a tree. If these films teach us anything, it’s that there’s much more for humanity to learn from observing one’s own personal sense of duty. Going into each of these films, I didn’t realize how much these two figures have in common and how important it is that these filmmakers were able to portray them with the nuance necessary to make an impact on the viewers. Picking apart kernels of truth within the works of Armstrong and Honnold is ripe for Jedi-like wisdom. For all the mindfulness and spirituality at play, it comes down to a meat and potatoes answer: Block out the noise, let go and do the big work, no matter the cost. 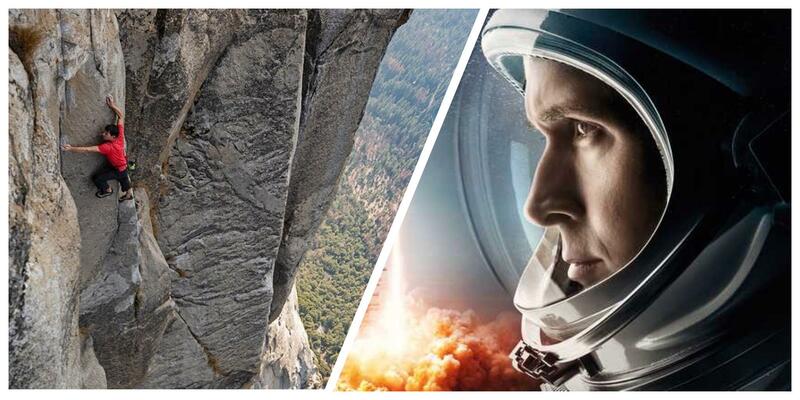 FREE SOLO opens Friday (10/12) in select theaters, while FIRST MAN opens nationwide on Friday (10/12). Fresh on Blu-ray: ‘SKYSCRAPER’ – Is this a nerf gun or an action movie?